Design a solution. Create a prototype. Test for results. Revise for effectiveness. Refine for performance. Learn about renewable energy. All accomplished while discovering ways to improve our environment. If you did all this, you would be participating in Friends of the Rappahannock’s (FOR) E-STEM programs. We are building our E-STEM, or Environmental Science, Technology, Engineering, and Math, programs with support from the National Environmental Education Foundation. Today’s youth spend plenty of time with technology; loading apps and listening to podcasts on smartphones, ensuring their smartphones sync with their computers, building entire universes in Minecraft, and much more. However, most young people seldom experience the opportunity to design and construct a solution to a problem with their own hands and without including a screen! STEM programs afford our youngsters the chance to build their own solution and discover how well it works. If a prototype is not successful, they keep re-engineering until it is. STEM offers a process of physical discovery observed only in workshops and art studios. E-STEM is creativity and functionality in one succinct bundle of environmental fun! First, we introduced our E-STEM ideas directly to teachers at professional development sessions by presenting the concept of teaching via “design briefs.” Next, we rolled out our two newest E-STEM challenges in our sold out summer camps. One entire morning during each summer camp week, we introduced campers to a water-related renewable resource design task. While some campers crafted waterwheels they tested in the Rappahannock River, others constructed litter catchers they proofed in a simulated stormwater drain. Our campers were excited when they realized they would get to build actual objects that would work and solve a problem. Summer campers that created water wheels loved testing them directly in riffles along the Rappahannock River. We even turned a dreary downpour day into an E-STEM day when we diverted water from our rain barrel to an extra gutter creating a water wheel sluice! Since the litter catcher program has less moving parts, we can use it with Kindergarten-aged children. 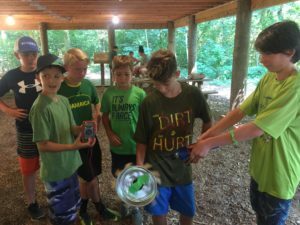 However, campers working in groups can have a wide span of ages and still accomplish the creation of a successful water wheel! Finally, we brought our E-STEM design challenges into classrooms as a complement to our growing MWEE programs. Throughout this E-STEM journey, all participants worked cooperatively to create STEM solutions to environmental problems. Where will our Education Department’s E-STEM programs go next? We endeavor venturing further throughout the Rappahannock watershed with our new E-STEM trailer of science! 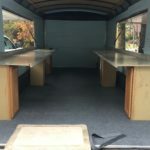 The E-STEM classroom we create in our trailer will port our innovative, hands-on design challenges expanding from hydro to additional renewable natural energy sources. lessons. Another promising addition may be solar powered boats where participants design the most effective paddles. Furthermore, our educators hope to inspire students to deeper understanding by exploring real-world problems and sharing results with their local communities through project-based learning programs currently in the design phase. Although Ms. Frizzle will not be driving, we hope the experiences in our E-STEM trailer will take students to new heights of imagination and discovery. 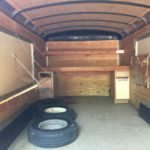 FOR Education Department is on the move, geographically with our E-STEM trailer, in scope with additional renewable natural resource lessons, and in programing to include project-based learning options. As Ms. Frizzle would encourage, “Take chances. Make mistakes. Get messy.” We, in the FOR Education Department, will help you!